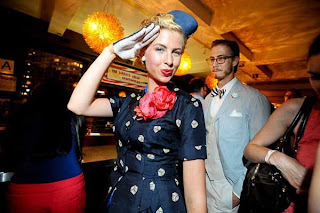 This year there are a multitude of terrific events for your Fourth of July vintage-retro partying in New York. Two stellar rooftop parties featuring patriotic big bands, burlesque, and timeless vaudville promise to be the perfect spot to enjoy fireworks fire works and get your dance on. There is also a genuine riverboat Jazz Age cruise in New York Harbor featuring first class drinking and dining, and the musical stylings of Michael Arenella's Dreamland Orchestra. This year the vintage-Retro nightlife veterans (The Salon, Wit's End and The Champagne Riot) annual collaboration is pushing the envelope and throwing parties on not one, but TWO of NYC's rooftop clubs that will showcase the finest in hot jazz music, vintage entertainment and raucous patriotic revelry! The LBE producers have also partnered with Lincoln Center's Midsummer Night Swing,for even more dancing, & live big band music! Here is a teaser from previous years' events. Shortly after its birth, jazz made its way to the industrial north on riverboats puffing up the Mississippi. This 4th of July, celebrate America's independence and her musical voyage, aboard a genuine riverboat. Dance, drink and dine as the New Orleans style Riverboat "Queen of Hearts" splashes through the night along the banks of Old Manhattan, enjoying unrivaled views of the fireworks and the hottest 1920s jazz entertainment this side of the Mason-Dixon.